Inspiration can strike at any time, and when it does it’s often difficult to ignore. I prefer to stick to a single project at a time, checking things off my to-do list with rhythm. But every once in awhile, I can’t resist the urge to stop everything and try out an idea. In order to create lots of rings for a craft fair this fall, I came up with a plan that wouldn’t interfere with my other projects: Every time I use druks in a design, I set aside one, and make a ring at the end - usually with the same beads I used in the preceding project. It’s been working well so far, at least until my latest project. The necklace I’ve been working on had two colors of druks, so I set aside one of each. Then, somewhere I got this inexplicable idea to make rings with rainbow striped bands. I liked it so much, that instead of making one or two rings with the colors I had set aside, I went through my stash to make the perfect rainbow palette. And I changed my mind about one of the druk colors after pulling all of the beads, so now I have all these rings on my to-do list! I haven’t yet decided if I’ll finish all four rings before moving on to my next Egyptian gods piece, but I did get started on one after finishing the rainbow pieces, since I had so many seed bead colors right there to choose from. When it comes to mastering beading techniques, sometimes distance is just as important as practice. This week I discovered all over again how much different a design can seem when you haven’t used it in a while. The double chevron technique I had chosen for a new collar was a last resort - I wasn’t eager to revisit this stitch, because I remember it being time consuming and a little awkward. Then I remembered how great the results are, and knew it would be worth it. I started with a palette of dark beige and terracotta to represent roads, and peridot and emerald for vegetation. The Ancient Egyptian god Min had domain over crops and travelers, and I wanted to capture both. I had also hoped to use some green white hearts, and a mix of emerald and rootbeer 8/o’s. When I switched out my stitch plan, I had to pare down the accents to just one color. It wasn’t until the necklace was finished that I realized that it wasn’t the task I was expecting it to be. It was fun, and again I’ve got a great looking collar. “Practicing” double chevron again made it seem a little bit easier than before - something that continues to happen with any stitch until you can practically whip a piece together without looking (not that any beader would!). Russian chevron chain is one of those more obscure beading stitches that deserves more time in the spotlight. Similar in appearance to Nepal chain, the weave creates a wide but delicate strip of beadwork that is perfect for lightweight bracelets. It is worked in three sections which are easily adapted by adding more beads to get a larger, more lacy piece. The traditional stitch begins with a simple two-needle weave. The length of the base section isn’t altered much by the addition of the chevron stitches, so there’s no need to predict the finished length of the beadwork - it will closely match the length of the base that you create. When working the two-needle base, keep a mat or pin cushion nearby to hold your needles between stitches. The basic steps are very straightforward, and become intuitive almost immediately. We’ll work with 2-color palettes for clarity, but once you understand the basic steps, using a single color or more complex pattern is easy. Cut a comfortable length of beading thread, about 2 yards, and thread a needle on each end. Pick up 12 color A seed beads, and center them on the thread. Use one needle to stitch up through the first bead added. Pull snug to form a small loop. With one needle, pick up 6 A, then secure the needle on your bead mat or pin cushion. With the other needle, pick up 5 A, and stitch up through the last bead added on the other thread. When you pull snug, you should have a round cluster of seed beads, with five on each thread and a single shared bead on top. Continue adding groups of 6 and 5 beads and connecting them this way, until the chain reaches the desired length. There is no need to use a specific needle for either the 5 or 6 bead pick-ups. In fact, it saves time if you alternate each time, using the needle that stitches through the shared bead to pick up the next set of six. Be careful not to tangle the threads as you work by keeping the resting thread secure and straight. When you have added your last cluster in the chain, pick up 12 or more color A. If you are making a bracelet or necklace strap, you can make the final loop large enough to fit over a toggle clasp or button. Stitch through the last shared bead added and pull snug to form the final loop. Stitch through the next 3 beads in the final cluster of the chain. Your thread should be exiting from the center-most bead of one side of the cluster. Pick up 7 Color B beads, and stitch through the 3rd A and the following A. Pull snug to form a little loop of new beads. Stitch through the first 3 B pick up and pull snug. Pick up 1 B, and stitch through the 3rd (center) A bead of the next cluster in the chain. Pull tight, and the first chevron embellishment is complete. You are now in position to start the next one: pick up 7 B, and stitch through the 3rd and 4th A. Continue working along the chain until you reach the end. Stitch the single B to the 3rd A of the final cluster, and weave in the thread. Flip the beadwork, and pick up the second thread. Pass through the final loop, exit from the 3rd bead on the bare side of the chain, and pull snug. Add chevron stitches along this side of the chain and you’re done! The two-needle variation is incredibly fiddly and it takes a long time to work up the base. While the ease of the chevron stitches makes up for this, you can speed things up further by using a single-needle approach. Cut a comfortable length of thread, and secure a needle on one end. Center a stop bead on the thread, and stitch through it again to lock it in place. Pick up 12 seed beads, followed by groups of 6 until you reach the desired length. (You can also use a pattern of 1 A and 5 B to make the second row easier). Add the final loop of seed beads - making it clasp-sized if desired - then stitch back up through the last 4 beads added before the final loop. Pull snug, and attach stop bead if desired to prevent loss of tension. Thread a needle on the tail and remove the stop bead. Skipping the first 12 beads, stitch through the first shared bead in the chain and pull snug to form the base loop. Pick up 5 beads, and stitch through the 6th bead in the chain. Continue adding 5 beads at a time until you reach the end. 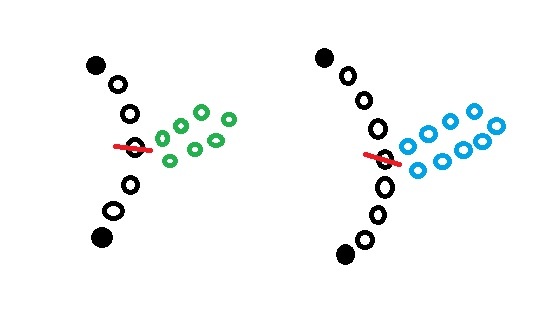 Pass through the final loop, and exit from the 3rd (center) bead of the last cluster added, opposite from the first thread. You’re now ready to add the chevron stitches as normal. The pattern repeats: pick up 7, stitch through 2, stitch through 3, pick up 1, stitch through 1. To increase the size of the chevron chain, add more beads to the base loops - still sharing only one bead each, and so that the beads on either thread have an odd number. The first set of beads picked up for the chevron stitch should be equal to the non-shared beads in the chain, plus 2. For example, if the base chain has loops of 7 non-shared A beads, you should pick up 9 B for the chevron stitches. 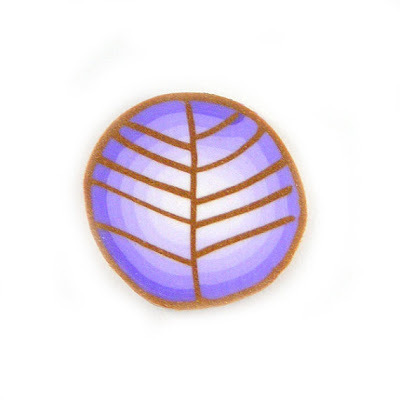 No matter how much experience we have with our beads and color palettes, sometimes when a new design is started, we just have to cross our fingers and hope for the best. Even when the first few inches of beadwork look great, a finished piece can fall flat. Sometimes a sample that looks mediocre becomes an amazing design. 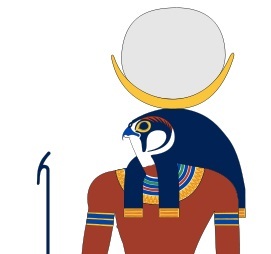 I was determined to use a dual palette of elemental colors with black and white accents for my Ma’at pendant, but I had a feeling that it wouldn’t look so great in the finished design. I chose olive for earth, aqua for water, red for fire, and royal blue for water. They looked great together on the hanks with black and white for accents, but had yet to be proven in the design. Furthermore, the trouble with double St. Petersburg chain is that you have to wait quite a while before seeing how the final pattern will look. Whenever I have doubts, I usually start the second row of stitches after finishing the first thread, just be sure that everything will look alright. Even though I used this precaution with Ma’at’s necklace, I still wasn’t sure how I’d like it in the end. Once both chains were connected and the bone ankh pendant was on, I was relieved to find that the palette and pattern were just as good as I had hoped. 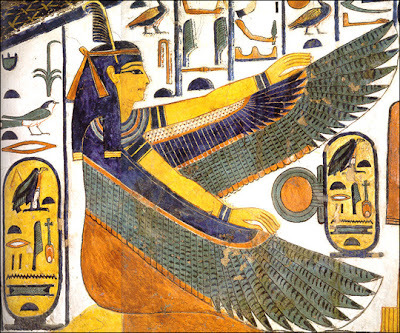 Ma’at is all about balance and harmony, and I like the way the colors enhance the feathery look of St. Petersburg chain, and play well with each other. Finishing this necklace was a little tricky, because I didn’t factor in bead sizes when decided which color to start with. The olive green seed beads have tiny holes, and when it came time to zip the first rows together, I ended up having to switch to a size 13 needle just to get the job done. Luckily, I didn’t break a needle in the process! Any bead weaver will tell you that although our craft is incredibly rewarding, it does require a fair amount of patience. This is especially true if you’ve always got a dozen ideas waiting for their chance to be created. Although committing to a more lengthy design takes some resolve, the results are usually worth it. This week I’m working with one of my favorite collar techniques, but one that I rarely use because it takes a long time to stitch. When I sat down to make a collar for the Egyptian god Min, I had already settled on a palette, and was planning to make a new netted collar. Unfortunately, the palette that I had my heart set on just didn’t look right, now matter how I patterned it. The basic ideas I wanted to convey with Min’s necklace were fertility (plants) and roads. I needed a technique where I could have smooth bands of both brown and green. I finally decided on a double Chevron chain, and although the collar turned out just right, I was disappointed that it didn’t have any room for those delicious green white-hearts. This piece is just waiting for the clasp to be secured, and then it’s on to a ring or two and something for Neith. Last week’s ankh pendant turned out splendidly. I admit I was a little worried that the black and white 8/o core wouldn’t work with the other stripes, but I love how it all looks in the finished piece. It’s one of the first bead weaving techniques that beginners want to master, one of the most commonly used stitches in beadwork, and a friend to seed beads of all shapes and sizes. Today our guest, Krafty Max, talks about the wonders of peyote stitch. Inspirational Beading: What is your all time favorite beading technique? Krafty Max: For me it is a really hard choice between herringbone and peyote, but I think I will have to say Peyote. Inspirational Beading: How do you first learn to use peyote stitch? Krafty Max: I am not really sure, I started stranding when I was between 4-5 years old, but I have creations that were done with the peyote stitch as far back as around 7, so somewhere in that time. If I really want to feel old I'll tell you that 'around' 7 was over 35 years ago! Krafty Max: One of my most recent creations is definitely my favorite. This creation is a piece of artwork and with over 40,000 beads and 120+ hours it is also my largest. It was designed and created for several beading contests (still to be announced if I was a winner). 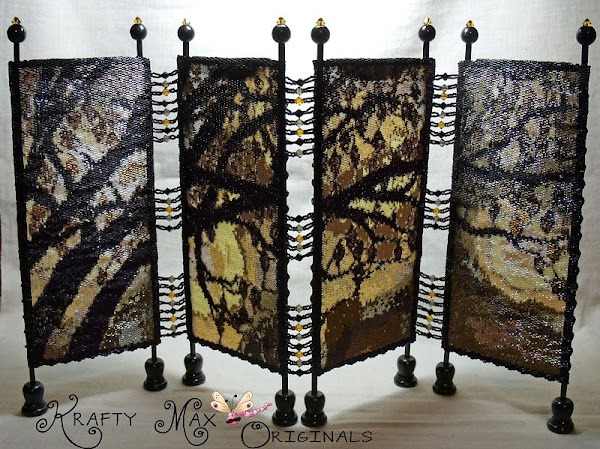 The story and photos are here : Reaching Tranquility Miniature Dressing Screen. Inspirational Beading: Can you share any tips for getting started with peyote stitch? Krafty Max: When I first started teaching peyote stitch to people it was very hard to explain, but then one of those amazing things happened and the tip just came to me! I always tell people to look at peyote stitch like it is a zipper. The teeth fit into each other - one up and one down - until the next row that is - one down and one up. It is the most amazing feeling to watch students faces as they are stitching to have that 'aw ha' moment when it all fits (pun intended) together! 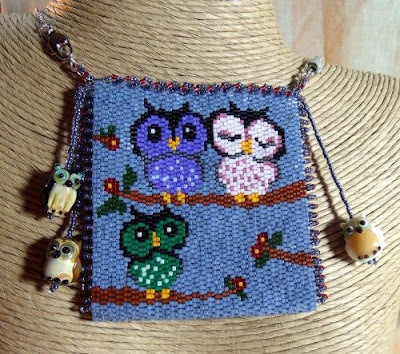 Krafty Max: For me there is just no substitution to Delica Seed beads. I have tried other brands and types, but the quality just isn't the same! I always explain to students that seeds beads come in two types: basic seed beads that are shaped like doughnuts, and then there are Delica seed beads that are shaped like cut straws. Krafty Max: Yes and no. Yes, it is a great stitch, but if someone were only learning one stitch I would recommend RAW (Right Angle Weave). It is much more versatile and can be used with just about any bead type or size. It also is very easy to learn to increase and decrease with RAW. Inspirational Beading: What is your least favorite thing about this peyote stitch? Krafty Max: The least favorite thing about Peyote Stitch is that it is only flexible in one direction. It is very flexible in one direction, but the other way is very stiff. Krafty Max: Yes, I do single, double, triple and even quad-drop peyote. I personally like single and double about the same. The only big factor to which one I will use is the designing of the patterns I am going to use (I design all my own patterns, as well). Although summer isn’t a rainy season that might bring a lot of rainbows, there’s still something very summery about a full spectrum of colors in one place. Rainbows are connected to carnival prizes, sugary drinks, ice cream sprinkles, and lots of happy moments. Summer is a great time for rainbow jewelry. The trouble with having all of the boldest colors in a single piece of jewelry is finding pieces to go with it. Personally, I like to go with a combination of neutrals. Nothing sets the stage for a rainbow quite like black and white. For this collage, I mixed black and white with earthy neutrals and sky blue, but something was missing. I added a few accessories to get a more CMYK look as well. A little yellow polish and some magenta lip gloss? Why not! It’s summer. The Nangara fiber statement necklace is gorgeous in design as well as color. I found a few fun tutorials for inspiration, using fibers and rainbow palettes. 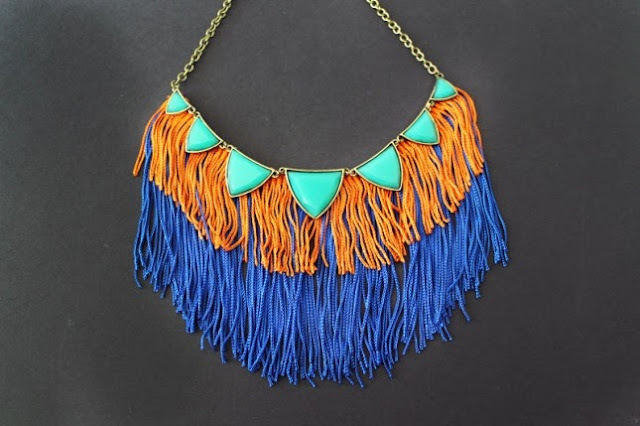 DIY Fringe Statement Necklace Tutorial by Brit+Co, using ready-made necklaces and fringe. Trellis Necklace Tutorial by Just Another Hang Up, crocheted with trellis ribbon yarn. 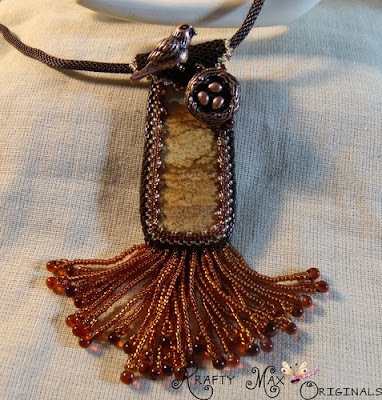 Hand-Wrapped Tassel Necklace Tutorial by CraftTuts+, with color blocked embroidery floss. Rainbow Pom Pom Necklace Tutorial by Rags to Couture, with a trendy Peter Pan collar shape. DIY Rainbow Ribbon Necklace Tutorial by Clones N Clowns, with silver and pretty pastels. What comes to mind when you think of rainbows? Back when I started getting serious about beadwork, I developed an aversion to opaque seed beads. Something about them - or the designs I was making with them - seemed rather…quaint. Opaque chromatic colors started to remind me of crayons, clowns, and cheap plastic jewelry. I wanted to get away from these themes, and started cultivating a seed bead stash with unique colors and finishes that I thought were more sophisticated. Fast forward several years, and I’ve rediscovered the beauty of opaque beads. With so many of my designs being influenced by tribal beadwork and Egyptian art, opaque colors are often ideal for the pieces I want to make. Simple shades of blue, red, and green now dominate my bead stash. After trying several times to get the effect of moonlight for my latest project palette, I finally settled on opaque royal blue and bone white. Although using opaques has become acceptable for me again, I almost wish I had some iris or lustered blue for this piece. I still love the way both colors look together, and the addition of some silver-lined crystal 6/o’s leftover from last year’s destash challenge brought everything together. This collar is inspired by the Egyptian moon god Khonsu. As one of the deities that served many roles and underwent many changes over the centuries, a simple collar with an inspired palette was the ideal tribute. Summer and the beach go together like carnivals and cotton candy - especially when you live in a cold climate. The few months of the year when it’s warm enough to swim outdoors are precious, so it’s no wonder that July and August are favorite months of aquatic themed designs. Although I’m feeling pretty swamped with the approaching deadline for my Egyptian Gods challenge less than six months from now, I can’t help but be inspired by sunny weather and days at the beach. Right now, all of my bead favorites are fit for mermaids. Shell and pearl beads are one of my biggest bead weaknesses. They are natural and sustainable, but they’re a little on the anonymous side, so I try to keep my consumption to a minimum. This is tough, because I adore the natural, organic patterns and colors in shell beads. Right now I’m craving a project for this gorgeous strand of hammer shell heishi from Happy Mango Beads. The chip shapes and soft browns are so perfectly beachy. Ladder-stitching Egyptian inspired cuffs has really helped me get over my fear of thread-fraying bugle beads, and they’ve really grown on me. I’m starting to build up a stash of bugles again, and right now my favorites are these lovely satin aqua tubes from Shipwreck Beads. Not only do they have a great tropical hue, but the finish is perfect for breezy summer designs. The newest addition to my stash are these pretty turquoise Rizo seed beads from Fusion Beads. I haven’t had a chance to try them out yet, but I’m eager to see how they play in my designs. I love the uniform shape, which should provide the same effect as drops, but with a little more sharpness. At one time or another, most beaders are a bit guilty of hoarding. Sometimes we have beads that we hold on to for years, perhaps waiting for the right inspiration, or maybe they’re just too precious to use. Occasionally, bead hoarding pays off, when a design idea comes along that wouldn’t have been possible without those pieces that have been kept under glass. For the past several months, I’ve been wanting to use my last bone ankh pendant for a side project, but I kept putting it off, thinking that perhaps it would come in handy during this year’s challenge. I didn’t want to risk being without it should a project come along that wouldn’t be the same without an ankh. This week, that project is on the bead tray. When designing a necklace for Ma'at, the goddess of truth and balance, I decided to go for a feathery St. Petersburg chain. At first, I thought about revisiting the scalloped variation with another turquoise wedge focal, but the loops of beads would obscure the feathery look of the chain. Ma'at was sometimes shown offering the Breath of Life by holding an ankh to the lips of the pharaoh, so a simple pendant was the way to go. I created a palette to represent the elements, and things are well under way. Last week’s moon collar is finished. I’m very happy with the final palette, although a mistier shade of blue would have been ideal. It’s always exciting and satisfying when a beader discovers a new go-to material - those beads and components that work with all of their favorite designs and techniques. For my most recent Egyptian gods project, I got to use two of my all-time favorites in perfect harmony. Last week I was working on a collar for the Nile god Khnum, who moulded beings from Nile clay on his potter’s wheel. I started by combing several different shades of brown - including one of my favorite gold substitutes, Autumn Tuscon. With just a little turquoise to hint at the Nile, all I needed were some accent beads. I was really happy with the palette overall, but it needed some extra color, and something to give the impression of ancient pottery. Vintage white hearts and trade beads were the perfect fit with their irregular shapes and rustic colors. With so many of my favorite things in once piece, this is one of my top collars so far in the challenge. There’s nothing quite like a handmade bead to make a jewelry project memorable. 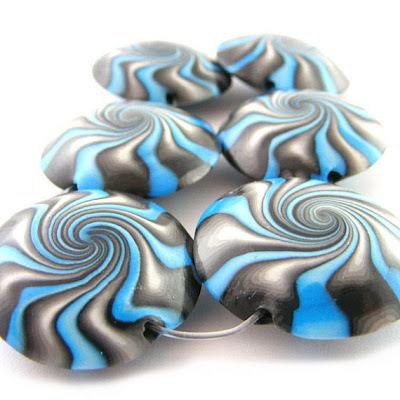 Thanks to the amazing beauty of polymer clay canes and other techniques, artists can create gorgeous sets and bead ensembles for our favorite jewelry styles and beading techniques. 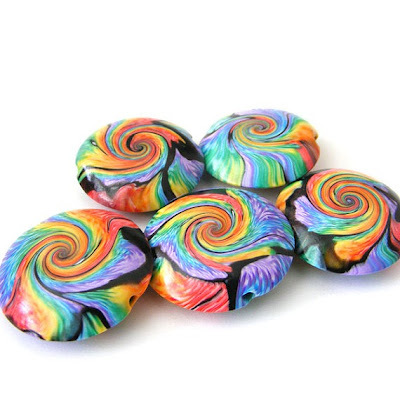 One artist whose work is a pure delight to behold is Roly of Rolyz Creations, a polymer clay bead maker from Israel. 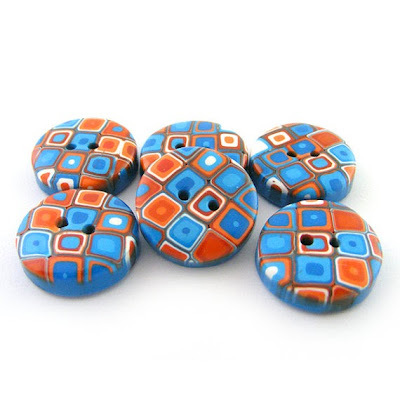 Inspirational Beading: How did you first get into polymer clay? Roly: Few years ago I had to resign my job due to health reasons. I was looking for something that I could do as occupational therapy, and I saw adds for polymer clay classes. I had no idea what it was, but I was willing to give a try, and I LOVED it! Inspirational Beading: Do you remember your first bead creation? Where is it today? 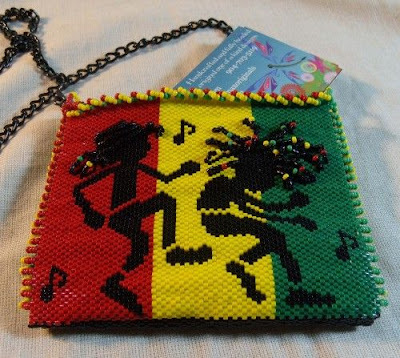 Roly: My first beads were a part of keychain/ bag decoration. I gave away A LOT of my early creations, so i have no idea where they are today. Inspirational Beading: Where do you like to look for new inspiration? Roly: Pinterest is a great place for inspiration. Roly: I love all shades of purple. I think it works well with other colors to create great combos. Inspirational Beading: What is your favorite style, shape or technique? 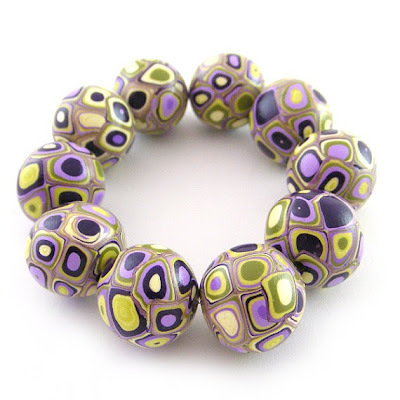 Roly: My favorite beads style is swirled lentil beads. They are by far the most time consuming, but I just love the result! Inspirational Beading: In your opinion, what’s the best thing about small handmade bead shops? Roly: Being able to purchase unique beads to create your one of a kind item. You can also ask for custom orders. Many of the seller will be willing to work with you. 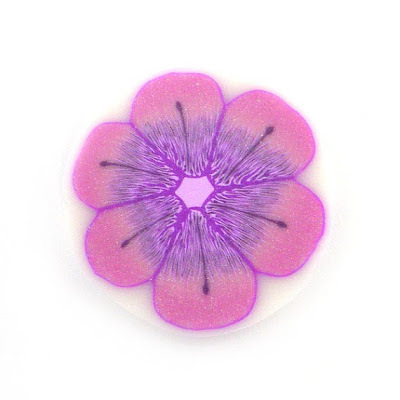 Inspirational Beading: What makes your designs stand out from other polymer clay designers? Roly: My color combinations and using my own flower canes, which I'm very proud of. Inspirational Beading: What is your favorite thing to make with your beads? Roly: Today I focus on creating beads sets. I love it when a costumer shares with me their creation with my beads. Inspirational Beading: What is the most interesting item in your shop right now? Inspirational Beading: Do you have any plans for new products, shapes, or styles this year? Roly: I hope to bring back a best seller from the past - "Van Gogh" rainbow beads. 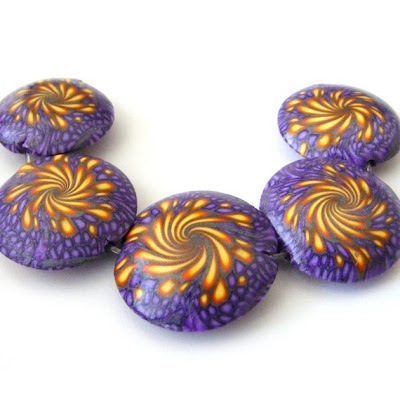 You can check out more of Roly’s gorgeous polymer clay beads, buttons, and handmade canes in her Etsy shop - Inspirational Beading readers can receive a 10% discount until December 31st 2013, by using the coupon code INSPIRATIONALBEADING during checkout at Rolyz Creations. To see more inspirations and news from the shop, follow Roly on Twitter and Pinterest.